In his Christmas reflection, Fr. 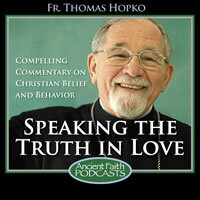 Thomas examines what "Peace on Earth, Goodwill Towards Men" means and what it doesn't mean. Peace is not simply the absence of conflict but rather a virtue reflecting the character of God Himself. Speaking the Truth: God Is With Us!